Playmobil Secret Boxes are a line of play boxes that can be unfolded to reveal environments that children aged 4 to 10 years old will enjoy playing with. Smaller pieces, like characters, furniture and other items appropriate for the setting, as stored in the box. At the end of the day, simply fold the box up, place the pieces inside and put it all away in one compact package. Parents looking for non-violent and completely wholesome toys for their children should not miss out on the Playmobil Secret Boxes line. They are imaginative and will ensure hours of fun for their kids. They are also compact so not a lot of space is need to play with them, and you won’t have to deal with the mess usually associated with games such as these, since all the parts are contained in a single, compact box. 4 – 10 years old. Small parts present a choking hazard for kids under 3. The size of the Playmobil Secret Boxes is a point in their favor. Each box is small and compact, but the detail is not compromised. There are five boxes currently available: the Police Station, Dragon’s Lair, Princess Castle and Horse Stable. Despite being compact, we are amazed by the attention to detail that is apparent in each of these boxes – take a look at the detail of the red dragon, the knights’ swords, the princess’ vanity table, the surveillance monitor at the police station, and more. The unfolding concept is also a fresh idea. It’s like a foldout storybook, but you get to create your own story. The setting is provided, the characters are already there, and it’s up to the child’s imagination to come up with the own plot. The kids have full control. As mentioned earlier, parents do not have to deal with messes when this is played with. When the kids are done playing, all they have to do is to store all the pieces inside the box and fold it back up again. The risk for losing pieces is greatly minimized. Playing with the Playmobil Secret Boxes also does not require a lot of space, and the same is true about its storage. Just stash it somewhere until it’s time to play it again. Right now, we can’t think of anything to dislike about the Playmobil Secret Boxes. It would be fun to have more themes or box types, though. Parents should also supervise playtime since there are pieces that may be too small and pose a choking hazard. Each box in the Playmobil Secret Boxes line costs $27.99. 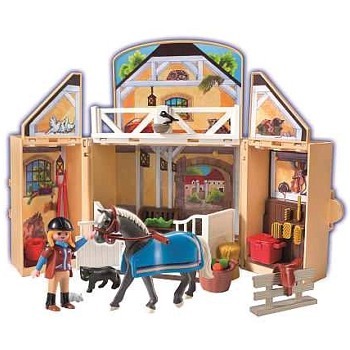 Playmobil has not made any announcements regarding the warranty and guarantee terms and details for the My Secret Box series. Considering how compact, child-friendly, fun and imaginative the Playmobil Secret Boxes are, there is no doubt that these are play boxes that are worth spending your money on. The Playmobil site will make the Playmobil Secret Boxes available for sale to everyone. You can also check out other online merchant sites such as Amazon to get great deals on this product. Having fun need not be a secret any longer! Let your kids’ imagination soar with each of the Playmobil Secret Boxes.